For National Poetry Month, I've given you poetry links, collections, and picture books. Today I have a set of books where one poem is made into a picture book. Enjoy. I know, another Prelutsky book that seem different from the style that I attribute to him. I may need to give the man more credit. 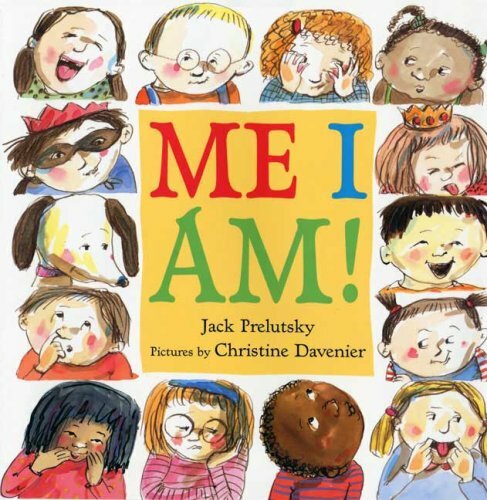 For this book, I love the way this poem expresses the uniqueness of each person and celebrates our individuality. It's like a personal anthem. "I am the only ME I AM, who qualifies as me; no ME I AM has been before, and none will ever be. "The poem carried through the pages is lovely, but the artist, Christine Davenier, has taken it another step into a celebration of childhood. Each two-page spread is a story in itself, told in the pictures. Over two pages, we see a girl trying on a frilly dress, rejecting it, putting on play clothes, skating away, falling, and getting up again happy. There is another story for a little boy, and then another little girl, and then in the end they all come together. So much more is going on in this book than the words, and it's all good. The poetic text is simple - "Rock, stone, pebble, sand; body, shoulder arm, hand; A moat to dig a shell to keep, All the world is wide and deep." 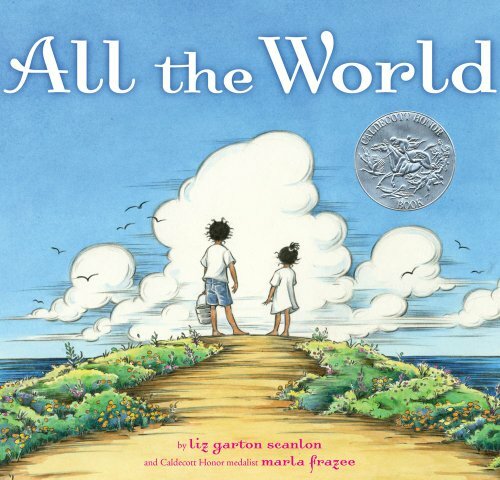 The book takes a multicultural family through a day that focuses on their connection with each other, with friends and neighbors, and the world around them. There are beaches and parks, gardens and restaurants, the big outdoors and the cozy space of home. The sentiment is lovely and is made more so by the detailed illustrations and breathtaking panoramas. This title encourages repeat readings to expand on the stories contained in the pictures, and the beauty contained in the message. 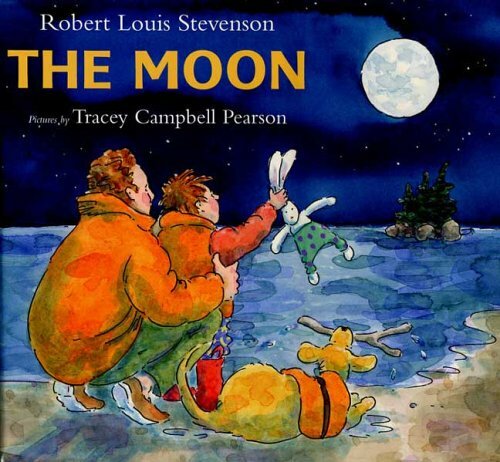 Robert Stevenson’s poem - "The moon has a face like the clock in the hall;/She shines on thieves on the garden wall,/On streets and fields/and harbour quays" - is brought to life by illustrator Tracey Campbell Pearson. She turns this poem about the moon and the world at night into a story where a father wakes up the boy (or girl with short hair - it could go either way) and takes him out on a nighttime adventure. They say goodbye to mommy and the baby, but take the dog and cat along. They drive through the country to a dock, get on a boat, and go on a nighttime ride. You can imagine what a treat this would be for an older sibling to have a special trip with daddy after bedtime. Pearson has made each picture such a feast for the eyes, with incredible attention to detail and to the mood. A fantastic book that may inspire your own nighttime adventure.